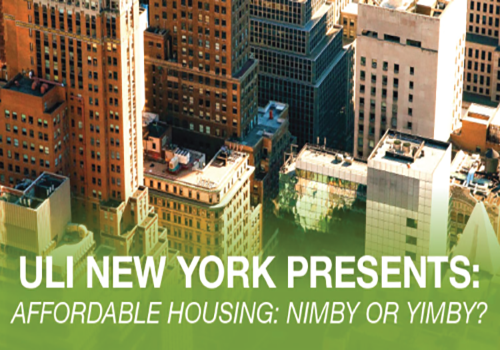 Affordable Housing: NIMBY or YIMBY? Co-working offices are transforming the New York City office market and pose unique opportunities and risks for building owners and co-working providers. While the “space-as-a-service” office sector is in high demand, determining where, when and how to set up shop is laced with legal implications that will dictate the success, profitability and viability of these deals. Many elements of the traditional landlord-tenant relationship are up for grabs. Issues include how rental obligations are structured, limitations on use, flexibility around redesigning and refurbishing the space from time to time to respond to ever-changing market demands, and how construction can be effectively contracted for and administered. Please join Ellen Sinreich and ULI New York for the annual Real Estate Outlook and presentation of Emerging Trends in Real Estate on January 29th at TheTimesCenter in New York City. Hear from industry veterans and development visionaries on where to place your bets in 2019 and key insights into the forces that are shaping the real estate business in the New York metro region. Please join Ellen Sinreich and the Urban Land Institute for a ground breaking program focusing on the nexus between cyber security and real estate. The rise of intelligent buildings and the proliferation of technology throughout the real estate industry represent opportunities for increasingly sophisticated cyber attacks. Once viewed as an IT issue, the real estate industry’s cyber vulnerabilities require an industry-wide examination of the impending threats and how we protect our buildings, our employees, and our businesses. Please join Ellen Sinreich and the New York District Council of the Urban Land Institute for a ground-breaking program about the high-design, mixed-income, multi-scale housing that is being developed in a variety of New York City neighborhoods. High quality residential design has traditionally been associated with boutique projects for high-income occupants. Today, a new generation of developments is featuring high quality design for a mixed range of incomes in neighborhoods outside the high-end Manhattan and Brooklyn cores. These projects feature designs built around public space and smart urban strategies, accommodate a range of incomes and benefit from the close collaboration of multiple developers and designers. The three projects that will be highlighted are The Peninsula in the Bronx, Essex Crossing on the Lower East Side, and 420 Kent in Brooklyn. Learn more and register. Please join me at the New York Law School Rooftops Conference for a panel discussion on the do's and dont's of letters of intent for commercial leases in New York City. Well drafted letters of intent can minimize the time, cost and risk of getting commercial leases over the finish line, while letters of intent that are incomplete or inaccurate increase the time, cost and risk of completing leases. Our panel will cover the key items that should be addressed in letters of intent, including escalations, assignment and sublet, guarantees, construction and renewal options. Link here for more information, and registration details. December 5, 2017, Practising Law Institute, 1177 6th Avenue — Join Ellen Sinreich for a lively, in-depth presentation exploring the legal and operational issues that are to unique to shopping center transactions. At this program, issues ranging from the impact of omni-channel retailing and the emergence of new kinds of shopping center tenants, to the importance of understanding and coordinating use restrictions, co-tenancy requirements and the competing needs of retail landlords and tenants will be covered. This presentation is part of the Practising Law Institute’s 19th Annual Commercial Real Estate Institute. More information. October 27, 2017, JW Marriott, San Antonio — Please join Ellen Sinreich at the ICSC (International Council of Shopping Centers) Law Conference on October 27, 2017 in San Antonio for a peer to peer workshop on tenant improvement allowances. We’ll be delving into strategies that can be incorporated into leases to avoid pitfalls from both the landlord and tenant perspectives. It’s one thing for a landlord to agree to pay the tenant improvement allowance, but it can be quite another thing to actually fund the allowance as, and when, promised. More information. Please join Ellen Sinreich and the Urban Land Institute for this timely program on retail real estate. While retail properties are at the forefront of many communities and continue to fuel employment and tax revenues, retailers and owners face significant demographic and economic challenges, as high-end retail sales decline, store closings increase and e-commerce continues to drive shoppers away from brick and mortar locations. Our speakers will address whether the sometimes-apocalyptic headlines tell the full story, how the changing market will affect the retail industry and how innovation and the advent of new technologies can drive even greater transformation. Please join Ellen Sinreich for a lively, in-depth presentation exploring the legal and operational issues that are to unique to shopping center transactions. Ellen and her co-presenter, Nicole Mesard, a real estate partner at Debevoise, will address issues ranging from the impact of technology and terrorism on shopping centers, to the importance of understanding and coordinating use restrictions, co-tenancy requirements and the competing needs of retail landlords and tenants. This presentation is part of the Practising Law Institute’s 18th Annual Commercial Real Estate Institute. Click here to register and for more information. Please join Ellen Sinreich and the Urban Land Institute (ULI) for a fascinating look at the transformation of Detroit from a failing metropolitan area to a city on the rebound. Learn first hand about the changes taking place from developers, business owners, lenders and public officials who are working together to bring the jobs, housing, commercial development and basic services necessary to create a thriving city. New York’s outer boroughs are booming and many are looking to Queens for its development opportunities. Central Queens, from LGA to JFK along the Van Wyck corridor has become the center of much of the expansion. This redevelopment includes the construction of Flushing Commons by F&T Group, a mixed-use project including residences, retail, hotel/office space, community space and a YMCA; and Skyview Park in Flushing by Onex Real Estate Partners. Please join us for a lively presentation by the public sector officials and private sector developers who are involved in these projects. There will be a reception following the presentation. Please join me and the International Council of Shopping Centers for this not-to-be-missed breakfast meeting and get up to speed on the technology boom that is disrupting the real estate industry. Technology startups focused on commercial real estate are changing the way real estate is offered, sold, leased, financed and operated. You'll hear from the founders, CEO's and thought leaders of the CRE technology startups that are leading the way. Join us for the inside scoop on how you can gain a competitive advantage by taking advantage of what their companies have to offer. Don't be left behind! Please join Ellen Sinreich and the ULI New York District Council for the inaugural ULI New York Awards for Excellence in Development. This new awards program seeks to recognize outstanding real estate development projects within the New York District Council’s geographic region, both in the private and public sector, that exemplify ULI’s mission of providing leadership in the responsible use of land and in creating and sustaining thriving communities. Please join Ellen Sinreich, New York/Northern New Jersey State Director for the International Council of Shopping Centers (ICSC) and thousands of other retail real estate professionals for the New York National Deal Making Conference at the Javits Convention Center. Retail real estate owners, developers, brokers, lenders, municipalities, product and service providers, and of course, retailers will be gathering to exhibit, make deals and form successful business relationships. In addition to networking and deal making opportunities, there will be a Retail Runway; a keynote presentation by Joe Girardi, New York Yankees championship manager; and various educational seminars. Learn more. 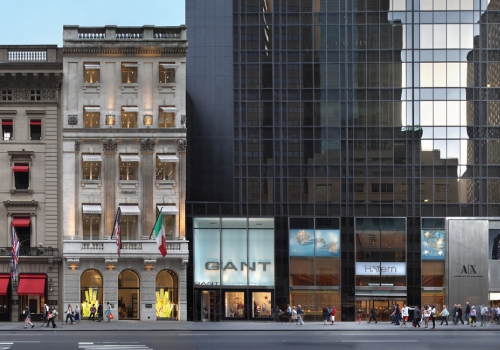 The New York Operations Committee of the International Council of Shopping Centers will present a panel discussion about the pros and cons of developing and investing in urban vs suburban retail projects. Topics will include differences in costs, design, operational efficiencies and investment returns. Peter Ripka, Ripco Real Estate Corp., will be moderating this panel of industry leaders, including Chris Conlon, Acadia Realty; Douglas Epstein, Modell’s; Robert Minutoli, Urban Edge; and Kathy Welch, Forest City. After the panel discussion, there will be an optional tour of Westchester’s Ridge Hill Shopping Center, which incorporates a unique combination of urban and suburban characteristics. Please join Ellen Sinreich at the International Council of Shopping Center’s 2015 Law Conference for this lively, interactive workshop about how retail landlords can increase revenues and cut costs. Ellen and Jerry Nelson, of Stark & Stark will share strategies for increasing efficiencies and minimizing waste across a wide spectrum of operational and transactional areas. Join us to learn more about how to increase profits and create value at your shopping centers. Please join Ellen Sinreich for this American Bar Association webinar on the ramifications of the recent decision by the California Court of Appeal on the enforceability of so-called “cotenancy clauses” in retail leases. These common provisions allow retail tenants to abate rent and/or terminate their lease if the landlord fails to maintain other required tenancies at the shopping center. In a case of first impression, Grand Prospect Partners, LP v. Ross Dress for Less, the court upheld the tenant’s termination right, but struck down the rent abatement remedy as an unenforceable penalty. During the webinar we will explore the implications of the case for retail landlords and tenants in California and beyond. ULI New York’s Women’s Leadership Initiative is back with its second annual Summer School Series — a professional development program designed to empower women with skills to excel in the workplace and beyond. In this interactive session, you will learn proven negotiation techniques with attention to building self-awareness and effective working relationships. Using a negotiation preparation framework, we will work through real negotiation challenges. Join Ellen Sinreich and the WLI for this unique opportunity to take your career to the next level by strengthening your negotiation skills. Please join Ellen Sinreich, New York and Northern New Jersey State Director of the International Council of Shopping Centers, and Shopping Centers Today for the inside scoop on the transformation of Lower Manhattan into a thriving 24/7 neighborhood with the fastest-growing residential market in the country and three of the largest retail developments in the country, including Brookfield Place, South Street Seaport, and the Westfield World Trade Center retail hub scheduled to open during the fall of 2015. Edmund Mander, Editor-In-Chief of Shopping Centers Today will be moderating the discussion with public and private sector speakers Eddie Gindi, EVP and Co-Owner of Century 21 Department Store; Brent Habeck, EVP, Strategic Leasing, Howard Hughes Corporation; Edward Hogan Jr., National Director of Retail, Brookfield Properties; Jessica Lappin, President, Alliance for Downtown New York; and Janno Lieber, President, World Trade Center Properties, Silverstein Properties. Please join Ellen Sinreich and the New York International Council of Shopping Centers’ Next Gen Committee for an evening of networking, cocktails, and roundtable discussions with retail real estate industry leaders: Richard Chera, Crown Acquisitions; Jeffrey Altman, Houlihan Lokey; Rob Gifford, AIG Global Real Estate; Joel Braun, Acadia Realty Trust; Shannon Ching, Eastdil Secured; Dmitri Lalagos, Triple Five Group; Patrick Quinn, iPic Theatres; David Robinov, Ackman-Ziff; Greg Heym, Halstead Property and Stephen Plourde, The McDevitt Company. Click here to register. Please join Ellen Sinreich, Chair of ULI’s NY Women’s Leadership Initiative Membership Committee, at a special networking breakfast for new WLI members. Meet WLI Steering Committee members and learn how your WLI membership can help to propel your career forward and increase your visibility in the real estate industry. Please join Ellen Sinreich, Co-Chair, for this exciting program sponsored by the Urban Land Institute about the dramatic changes in urban retail real estate. Shopping in our downtown centers has become more than just a commodity, it has become an experience. Robin Abrams, Executive Vice President of The Lansco Corporation, will be moderating a panel of industry leaders, including Kathy Welch, EVP & Director of Retail for Forest City Ratner Companies, Brent Habeck, EVP Strategic Leasing at The Howard Hughes Companies, Susan Fine, Founder & CEO of OasesRE and Rohan Mehra, Co-Founder & Principal of the Prusik Group, as they discuss how a variety of exciting new retail projects in New York City are responding to the changing demands of consumers, retailers and regulators. Ellen returns to the premier retail real estate sustainability conference sponsored by the International Council of Shopping Centers where she will lead an interactive boardroom session on the value of green leases. During this session, Ellen will focus with a select group of participants on how to overcome the “split-incentive” so that green improvements, which reduce costs and increase bottom line performance for both landlord and tenants, can be implemented at existing multi-tenant retail properties. For more information and registration, visit icsc.org. The Empire State Building replaced its traditional exterior tower lighting system with an energy-efficient LED lighting system. At the upcoming Energy, Money & Law: Investment and Legal Strategies for Advanced Energy Performance in Real Estate, Ellen and her co-panelists will discuss how re-structuring traditional legal relationships can pave the way to financing large scale energy efficiency projects. Sponsored by the Steven L. Newman Real Estate Institute of the Zicklin School of Business at Baruch College, CUNY, this full day conference will also cover emerging regulatory trends and standards of care, as well as the financial, legal and technical underpinnings for investments in energy efficiency improvements, renewable energy and the energy industry. For more information and registration, visit baruch.cuny.edu. Please join Ellen Sinreich in Las Vegas at RECon, the global retail real estate conference, where she will be leading a RECon Academy session on creating a financial framework for greening multi-tenant retail properties. Ellen will use the newly published ICSC Green Study Lease (which she prepared) as a template for how landlords and tenants can collaborate to create resource efficient, healthy and comfortable properties with financial underpinnings that work for both parties. Ellen Sinreich is co-chairing this upcoming installment of the Women's Leadership Initiative Speaker Series featuring Abby Hamlin, Founder and President of Hamlin Ventures and Faculty Member of Columbia University's School of Architecture. Sponsored by the Urban Land Institute, this program will focus on entrepreneurial opportunities for women in the real estate industry today. Ellen Sinreich returned to Wharton this winter to teach the course, New Green Lease Paradigm for Tenants and Landlords, where she educated retail real estate professionals about how landlords and tenants can work together to green multi-tenant retail properties.